Abu Dhabi: A 29-year-old Canadian woman is reluctant to transition from her blue-collar fishing life embraced at the age of 12 into a white-collar existence, despite achieving high academic qualifications. Tiare Boyes from Victoria is now a postgraduate in Marine Resource Management. But instead of pursuing that inside laboratories and an academic environment, she chose to continue going out to the Pacific Ocean on a fishing boat to engage in marine management in a different way. “I am proud of doing sustainable fishing and serving fish to families in Canada and abroad,” she told Gulf News an interview in Abu Dhabi on the sidelines of the recent World Ocean Summit earlier this month. “Moreover I earned money to pursue my bachelor’s and Master’s degree from fishing.” She travelled from Canada to Abu Dhabi at her expense to attend the summit, expecting to meet interesting and inspiring people in ocean conservation. “When I flew to Abu Dhabi, I arrived after dark. I woke up to beautiful sunshine and my first view of the Arabian Gulf. I have felt very welcome in Abu Dhabi and have been happy to learn of some of the ocean initiatives going on here,” she said. Initially she felt embarrassment because of perceived social prejudices. As she attended a working class school in Victoria, she did not personally face that social stigma. However, in school she was told that girls did not go fishing. She heard that women are generally not involved in fishing. When she started going to the sea however, she came across many “fishing aunts and sisters,” who had defied that social stereotype. Over 17 years into regular fishing trips that last seven to nine days in the Pacific Ocean, she has built a sense of pride and accomplishment. Her mother was also a fisherwoman, who retired from work a few years back. She even met Boyes’ father during fishing trips and fell in love with him. Boyes’ boyfriend is also a fisherman. “In my life, my father [who is the captain of the boat] and boyfriend have been extremely supportive. I feel we all have a big role to play in promoting sustainable fishing practices to conserve the ocean and its fish stock for generations to come,” she said. Representing the second generation in her family’s fishing business, Tiare Boyes, 29, was happy to follow her father’s footsteps in both work and education. Her father, now 57, started fishing to fund his bachelor’s degree in Marine Biology. Even after successfully completing the course, he continued to be a fisherman, despite having white-collar opportunities in related sectors such as food production. She said they use their higher education to combine work and academic knowledge. A bachelor’s degree in Environmental Studies from the University of Victoria and Master’s degree in Marine Resource Management from the University of Akureyri in Iceland have empowered her to be a voice for other women in her profession as well. She has represented her association in several international platforms, including those of the United Nations agencies. 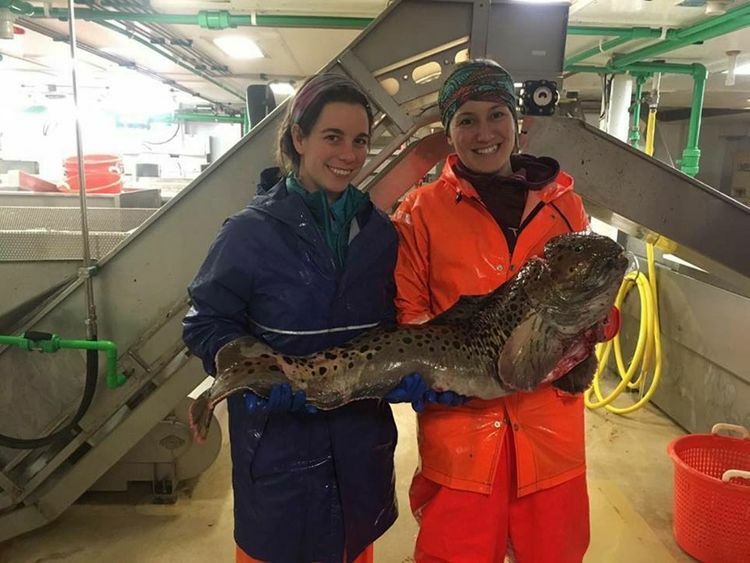 While preparing her Master’s degree thesis on fisheries, the experience in the ocean also helped her add statistical analysis. It is difficult to attract youngsters to agriculture and fisheries; however, promoting innovative technologies and the larger environmental cause in these sectors may make them attractive, according to Tiare Boyes. She said she finds a sense of purpose in working in Canadian fisheries sector that strictly follows sustainable fishing practices to check overfishing and pollution. “We are allowed to catch a certain amount of fish only on each fishing trip, which is electronically monitored in real time by the authorities. At the dock, each fish is electronically tagged on its tail, enabling to track who caught it, when and how,” she said. Boyes works not only for her interest in environmental conservation [sustainable fishing] but for socioeconomic reasons also. There is 100 per cent at-sea monitoring of all fishing trips in Canada, she said. All vessels are required to carry a government-designated observer or a video-based, GPS-equipped electronic monitoring (EM) system from a government approved service provider. During the fishing trip, the observer or EM system records all fishing locations and catches — both retained and released. The EM systems include gear activity sensors, a GPS [Global Positioning System] and at least two video cameras to record all fishing activity on deck. There is also 100 per cent dockside monitoring of all vessel landings. The management regime requires that wild Pacific halibut landings only take place at approved landing ports and all landings are monitored by a government — designated dockside validator. All fish landed — halibut and non-halibut species — are counted and weighed by the validator who also tags every single halibut in the tail with a unique serial number. “It is this tagging that allows us to trace the fish from the customer back to the boat,” said Boyes. These measures have proven effective at helping to keep harvests under allowable limits. In both Canada and the US, the commercial wild Pacific halibut fishery is closed during the winter months, as this is when mature halibut spawn on grounds along the edge of the continental shelf.